If you're an experienced turkey hunter you've probably bought and used thousand of dollars worth of equipment over the years. Camouflage clothing, feed, guns, ammunition, and lures all add up pretty quickly. It's likely you've already got a turkey call. Many hunters have several they like to use because of the slightly different nuances each turkey call creates. Admittedly the average turkey call is not all that expensive, but when you make your own you are in control of the exact tone you want it to make. Different calls can communicate to different turkeys, some call to males, others females, and even to younger or older turkeys. 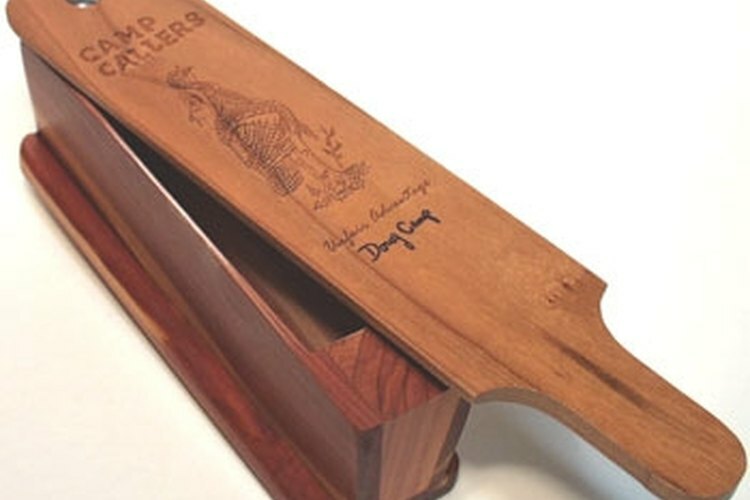 To that end, here is a guide on how to make your own turkey call. Use your T square to measure out, mark, and cut three wood panels from the aged cedar. Each should be 1-3/4 Inches tall by 6 inches long. A fourth panel should be 1-3/4 inches wide by 8-1/2 inches long. Measure two parallel lines on one of the three panels running down longwise approximately 1/8 of an inch from the panel's edges. Mark these lines with your pencil. With your precision router and a 1/8 inch diameter bit cut narrow channels on the panel following the marked lines. If possible angle the grooves slightly open outward toward the edges of the panel. Draw a line 1/4 inch longwise on one edge of the two other panels. Then draw an arc from narrow end to narrow end, with the pencil line running to meet the straight line at the tips, but the center of the panel's long edge at its midline. Use the skill saw to cut along these arches, so on each of the two panels you have one long straight side and one curved long side. Sand out any jags along the curved sides, but not so fine as to loss the wood's original grain. Line the grooves of the first panel with wood glue and fit the other two panels into place so that the straight sides go into the grooves. Set the box aside. Measure out two square pieces of wood from the pine board, each should be 1 inch tall, 1inch wide, and 1 inch thick. Designate a top and a bottom for each of these cubes. On the bottoms draw a centered square using 3/4 inch lines. Use your wood file to taper the sides of the cubes so that the top is still a 1 inch square, but the bottom meets the pencil lines as a 3/4 inch square. Fit each of these tapering cubes into the ends of the box, they should be held in place by shear pressure and will require no fixing agent if done correctly. Take the final wood panel and begin to shape one of the flat sides with the wood file. Unfortunately there's no other way to shape the paddle except through careful and exact workmanship, so take your time on this piece. The idea is to curve one flat side so that as it is worked over the top of the box, it will rub against the box's curved sides and produce a sound not unlike a turkey's call. Only work with one of the wood flats, leave the other side unmarked. Leave a line of untouched wood down the middle going longwise, and as you get further to the edges, the wood should become progressively narrower. Fit the paddle to the box, curved side down. Drill a hole in the top corner through the paddle and into one of the tapered blocks beneath. The hole should be less than an inch deep and no greater in diameter than your screw. Fit the spring between the tapered block and the paddle so the box will create enough resistance to squeak when you use it. Then thread the screw through the paddle, spring, and tapered block and tighten it securely. You're done. The older the wood you use, the better. The wood should be as dry as possible. Broken or damaged antique furniture is actually a good place to start looking for the right wood. Cedar is not the only wood you can use. Different woods actually produce different tones when used in a boxcall. The key is to find a tight-grain wood with the rings as close together as possible. Make sure to wear ear, eye, and hand protection when working with the saws.